When daddy came to pick us up from Ipoh last week, he brought along the gals’ belated X’mas pressies. Here, daddy is having fun with the gals with their new toy and guess what they’re doing? Any idea? My 3 gals were fighting to get hold of the gadget so that they could have the first view of a ‘creature’ inside the gadget. Baby the cili padi got to view it first. Whenever she screams “peeeeeeeash, I wan, I wan”, she gets it her way…. 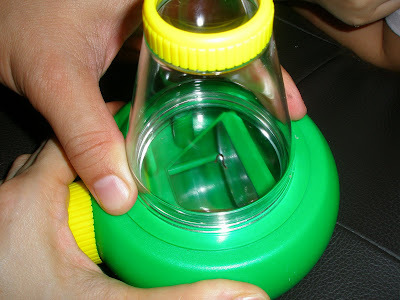 This is a toy magnifying glass and there’s a real worm inside. 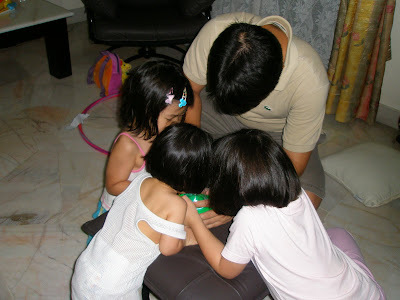 Daddy brought the gals to the garden to catch a worm to put it inside the gadget for the gals to have a magnified view of it. Cool toy indeed! Hahaha…your hubby also like to play with worm. Mine too, worm and frog/toads. He said, toys that need no battery. My kids like it too. Michelle… true, these are free toys and so much more fun! 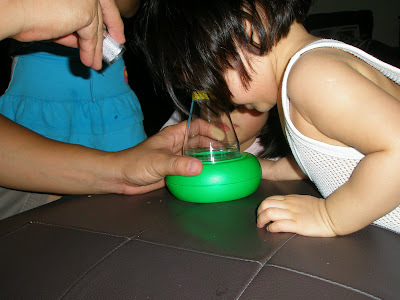 Ilewelynn… My hubs got it from Toys R Us, Mid Valley Megamall. Agnes… nope, they are not scared! Rachel… you are right! Yesterday #2 saw a dead worm and she wanted to pick it up to put it under the magnifying glass! Get some ants or spiders…a lot of fun to watch! nice toy! i guess i shud get 1 for my gal too. she’s not afraid of insects, even likes to touch an iguana too! eeewww…i feel so geli with iguana/lizard lah. Interesting toy. Baby C is so cute – am sure her sisters cant resist but to let her have her way.